Hotels.com – Hotel Reservation app. One of the most popular and liked hotel reservation app, this app uses Hotels.com website extensive network of hundreds of thousands of hotels to help you find the hotel you need, right now. The app shows you the best local hotels in your area or in a designated area, and you can choose the hotel you want, sorted by price, brand, reviews and score. The app itself is simple and you reach any hotel you want in a manner of seconds, see a picture of it, prices and even deals. The deals deserve special mention here, because they offer real money saving. The Hotels.com app shows you the local deals available, and has an extensive discount and special offers sections, for promotions, last minute booking and deals that can save you quite a lot of money. Hotels.com is no doubt one of the best booking and hotel reservation app today and almost our testers reported a very positive experience with it, especially concerning last minute deals and real money saving. The testers liked the simple interface which gets you the information quickly and clearly, but some expressed the need to be able to post a hotel review through the app, which you currently can't. It would have been nice to enter an exact address for hotel searches as well. Score: A 5 out of 5, because of its usability, simple interface, deals and other money saving promotions and extensive hotel network available almost everywhere. Good Points: All of our testers liked the simple and informative interface. A few clicks and you can find, sort and filter to get the hotel you want. Good rates, last minute deals and managing reservations make for a great booking experience. Bad Points: Our testers didn't really find a major problem with the app. 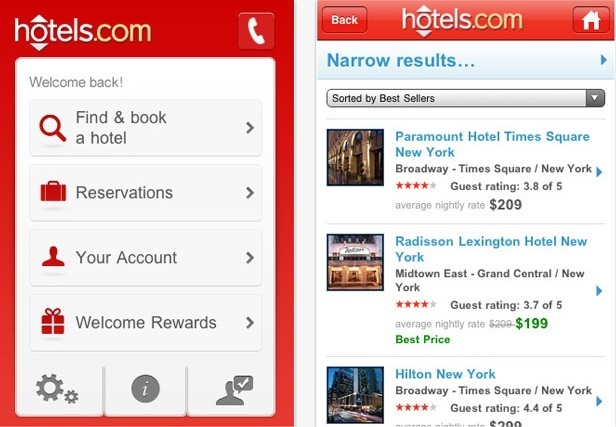 One tester remarked he would have liked to be able to review a hotel straight from the app while another remarked that on two occasions hotels that were available on the Hotels.com website weren't available on the app. Very few crashes were reported. Experience: On almost every smartphone for every tester the app worked without a hinge, though some very rare random crashes and failures to search did occur. Some of our testers who tend to travel more reported that they started to use the app during their trips and it allowed them to preplan a lot less and pay less money for accommodation. All in all, all our testers recommend this app whole heartily. Longevity: Almost all of our testers are keeping this app installed, though a very few use the Booking.com app the compare prices and availability between the apps.